Buckingham Palace should be opened to more paying visitors when the Queen is not in residence to fund improvements to the royal estate, MPs have said. 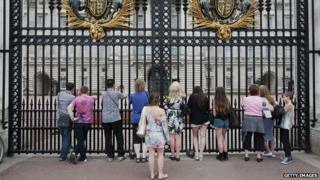 The Public Accounts Committee criticised the Royal Household for mismanaging its finances. Chairwoman Margaret Hodge said there was "huge scope for savings" on the annual £31m of taxpayer funds given to the Queen to spend on official duties. But a spokeswoman for the royals said spending was now more transparent. The Sovereign Grant replaced the old Civil List and grants-in-aid system in 2012 and is used to fund royal duties, pay staff and maintain palaces. The report said Buckingham Palace had overspent on the grant by £2.3m last year and had to dip into its reserves, "leaving a balance of only £1m at 31 March 2013 - a historically low level of contingency"
"I don't think we'd accuse anybody of profligacy but, what we are saying, is that we don't think the Queen is served well either by the Royal Household or, indeed, by the Treasury," Mrs Hodge told BBC Radio 4's Today programme. "They're not balancing books and they're dipping into their reserves," the Labour MP said. The Royal Household was "not looking after nationally important heritage properties adequately", saying that, in March 2012, 39% of the royal estate was "below what the household deemed to be an acceptable condition"
The household needed "to get a much firmer grip" on how it planned to address the backlog and cost repairs and the Treasury "did not require an estimate"
The Treasury had a duty "to be actively involved in reviewing the household's financial planning and management - and it has failed to do so"
While the committee praised the Royal Household for generating £11.6m last year - up from £6.7m in 2007/08 - it said more could be done. Pays for royal duties, staff and maintaining palaces. Calculated as a percentage of profits from the Crown Estate property portfolio, worth £8.1bn. Portfolio of land, property and assets held in trust for the Queen. Used to meet her official and private expenditure. Derived from personal investment portfolio and private estates, including Balmoral and Sandringham, and used to meet private expenses. Mrs Hodge said the Royal Household had escaped public sector austerity, only reducing spending by 5% in the past six years. "They've kept the same amount of staff in there that they had five years ago, so we think that they can eke more money and they certainly should deal with the heritage properties." She added: "The Queen can attract income - visitors to Buckingham Palace - but Buckingham Palace is only open 78 days a year, they only have about half a million visitors. "Compare that to the Tower of London - they have over 2 million visitors." She said boosting annual visitor numbers could help to pay for improvements both to Windsor Castle and to the Victoria and Albert Mausoleum, which had been waiting 18 years for repairs. Buckingham Palace's "state rooms" - those designed for monarchs to "receive, reward and entertain their subjects and visiting dignitaries" - have been open to the paying public during August and September since 1993. Media captionMargaret Hodge MP: "The boiler in Buckingham Palace is 60 years old... if it doesn't get replaced, the bills go up"
Profits initially helped to pay for the restoration of Windsor Castle, which was fire-damaged in November 1992, and now go to the Royal Collection Trust charity, which manages the Royal Collection - "one of the most important art collections in the world". A Buckingham Palace spokeswoman said: "The move to the Sovereign Grant has created a more transparent and scrutinised system, which enables the Royal Household to allocate funding according to priorities. "This has resulted in a more efficient use of public funds." She added that it was a priority for the Royal Household to "reduce the backlog in essential maintenance across the occupied royal palaces". A Treasury spokesman said "The new arrangements established by the Sovereign Grant Act have made the royal finances more transparent than ever while providing the long term stability necessary for good planning." The committee had not properly taken these changes into account, he added. The Sovereign Grant was £31m last year and is set to rise to £37.9m by 2014-15. Anti-monarchy pressure group Republic, meanwhile, accused the committee of failing to take account of the cost of security, costs to local government and any revenue earned by the Duchy of Cornwall and Duchy of Lancaster estates.